All week I have been craving spicy eggs. So today I decided to satisfy that craving by whipping up a healthy, spicy lunch with eggs. I was out of tortillas and cilantro, so huevos rancheros were off the menu. In their absence I decided to improvise with what I had in the cupboard. The result was these delicious (if I do say so myself), and healthy spicy baked eggs with spinach. We ate them with slices of fresh crusty bread to mop up the tomato sauce. This dish is incredibly simple. 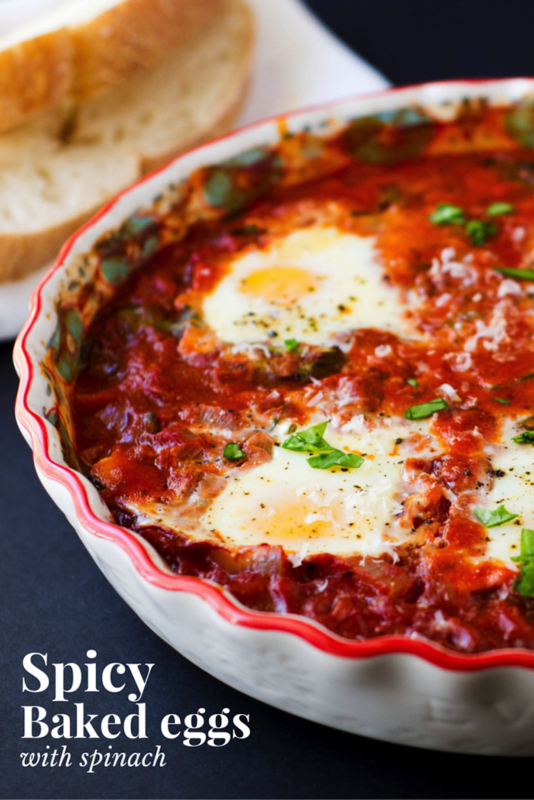 It consists of a quick, homemade spicy tomato sauce into which you crack some eggs. You place the whole thing in the oven and, voila, a healthy, spicy, protein-filled lunch. And if you are really in a pinch, you could even use a bought jar of arrabiata sauce. You too could be enjoying spicy baked eggs in no time at all. Heat the olive oil in a saucepan over a medium heat. Add the onion and cook gently for 2 minutes. Add the garlic, pepper flakes, and paprika and cook for a further 2 minutes. Pour in the tomatoes and break them up with the back of a wooden spoon. Add the tomato paste and sugar, and simmer on low for about 10 minutes or until it has thickened slightly. Add the spinach, and salt and pepper to taste. Pour the tomato sauce into a baking dish. Make 5 dips with a wooden spoon and crack one egg into each. Bake in the oven for 15 to 20 minutes or until the eggs are cooked. Sprinkle with parmesan and serve with crusty bread. What a great idea! That’s Sunday’s lunch sorted-with some new home made picked onions on the side! Hmmm homemade pickled onions. Yum! I have never baked eggs! This is incentive enough to have a go. It looks really good. Thank you. 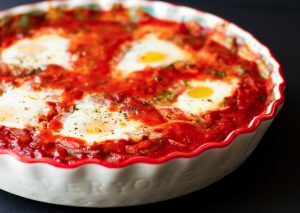 I had never baked eggs until this recipe either. What a tantalizing and vibrant dish! This looks like a great recipe to have on hand for when I haven’t gotten around to going grocery shopping. Thanks for sharing it! Thank you! I like to have a few recipes that use pantry staples for when the fridge is looking a little bare. This is definitely one of them. Thanks! I love eggs this way, I usually order them in cafes but have been meaning to try them at home! They are so easy to make. Very little time or effort required.